Installation of Concrete Sidewalks and Concrete Walkways. This hardwearing concrete not only looks beautiful, but it is going to stay looking absolutely stunning for many years to come. Installation of Concrete Stairs. 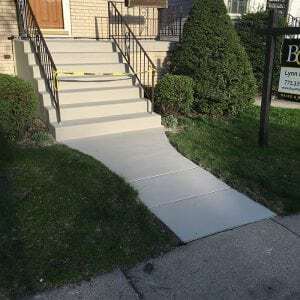 You will be surprised at just how much the installation of a brand new set of concrete stairs outside of your home or business can change the look of the property. Installation of Concrete Driveways. Perhaps one of our most popular services. Many people are tired of the material they have in place at the current time for their driveway, which is wearing down considerably overtime. Our concrete remains in place for many years and does absolutely no damage to the vehicle. We are also able to carry out the installation of a concrete floor in the garage. Installation of Concrete Patios, another one of our top services. Many people love concrete patios in Chicago as you gives you a fantastic place to relax in the summer, or perhaps they just want a beautiful patio to change the look of their home. We use the latest 4000 PSI Regular Concrete, regarded as some of the best concrete for installations; it is incredibly hardwearing and cost effective. We are able to deal with both residential and commercial projects. If you wish to find out any more about our services then please do not hesitate to get in touch with us.